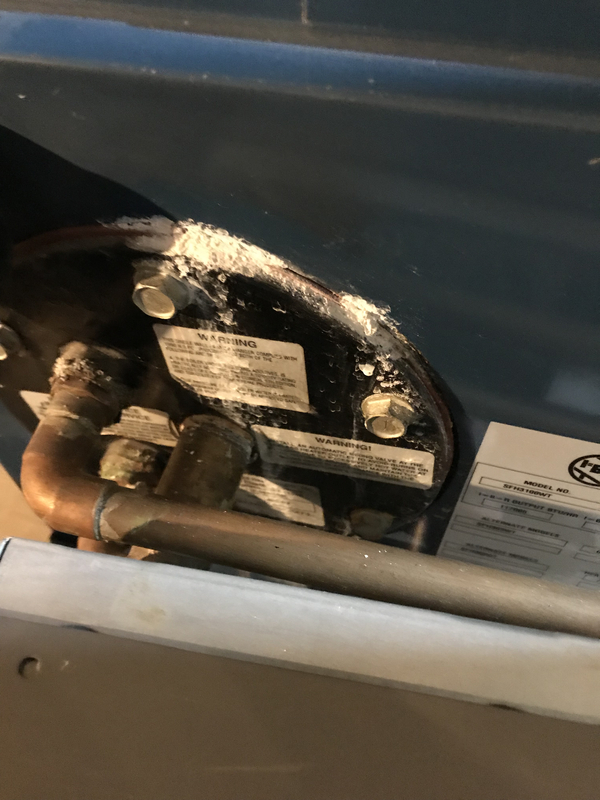 Hey all, I’ve noticing scale buildup lately on the outside of my boiler. Not sure what it is but it’s got me a bit worried. I attached a picture. Any response is appreciated! Is this steam or hot water? It looks like moisture from somewhere has evaporated leaving behind calcium. When you can turn off the boiler for a day, you can try the overfilling test to see if there are any leaks, (steam). It looks like that is a water to water heat exchanger perhaps for domestic hot water? I think the flange may be leaking. I would brush it and try snugging the bolts a quarter turn and watch it. You may need a new gasket and it could be done in the summer. I can’t tell for certain from that picture, but it looks like copper goes to steel without a dielectric union. That can cause corrosion from dissimilar metals.